Next week is Cider Week in New York City, complete with tastings, cider pairings and more. We thought we would give everyone a chance to get started early by making their own. The folks at Brooklyn Brew Shop have a kit with almost everything you need for three batches of tart, dry, bubbly hard cider. The best part? Making hard cider is so easy a child could do it, which of course we’re not recommending. You only need three ingredients to make hard apple cider: apples, yeast and honey. And we’ll let you in on a little secret: you don’t actually need to buy apples. You can use some pre-pressed cider from the farmers’ market. To that, just add a few packets of yeast and let it ferment for two weeks. After the yeast works its alcohol-creating magic, mix in three tablespoons of honey and bottle it. The honey will give the cider the extra sugar it needs to carbonate in the bottle. In another couple weeks you’ll have some bubbly, boozy apple cider ready to share with your friends. For fully diagrammed instructions, head over to the Brooklyn Brew Shop website. You can get a sweeter result using cider from McIntosh, Mutsu, Empire, and Bulmer's Norman apples. You can get a tarter result with cider from Winesap, Jonathan, Cortland, or Roxbury Russet. Add cinnamon, clove, star anise or vanilla for something a bit more desserty. If you use vanilla, split the bean and let it soak in a cup of water, then add that water to your cider blend. You can substitute pears for the apples and get a Perry—a traditional English pear cider. 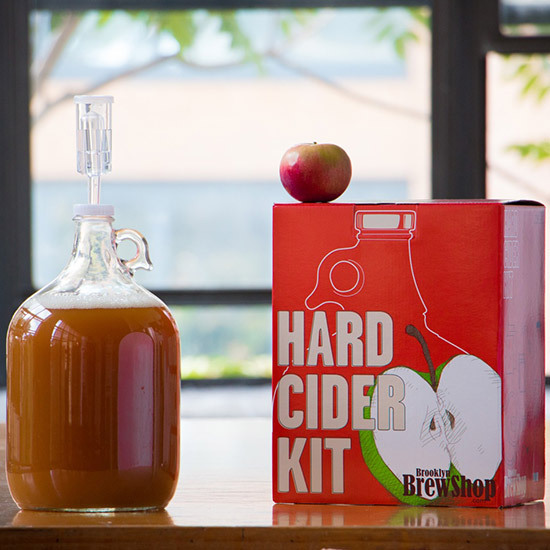 Brooklyn Brew Shop will be raffling off a hard cider kit at the Greenmarket Union Square Night Market on October 24. Check out all of the New York Cider Week events.